High-speed digital photography in a dimmed indoor range captures the power of the .45 AUTO cartridge in the new G30S. 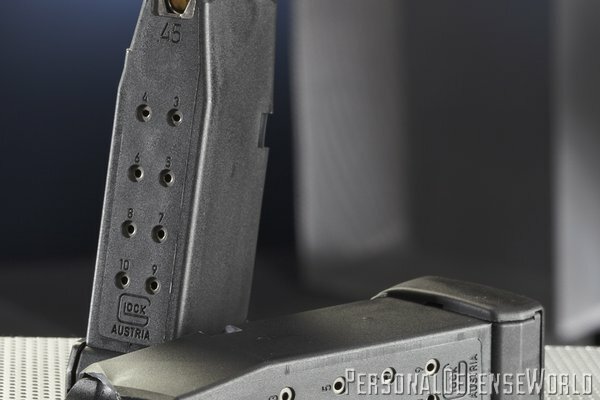 While firing single-handedly, the 13-round G21 mag can be clearly seen. 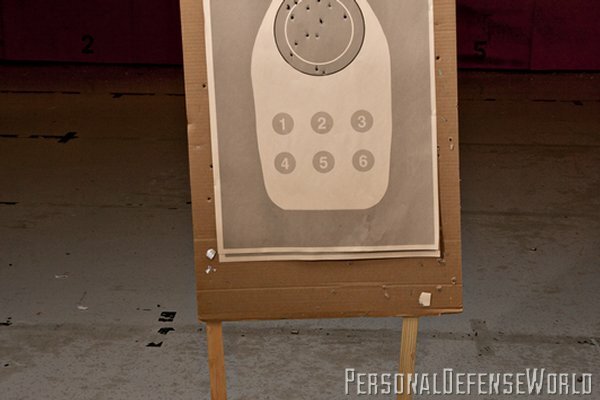 A five-shot group of 230-grain “hardball” fired while standing, unsupported, from 15 meters—it measured just over 2 inches! 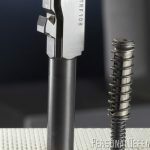 The G30S barrel is cold-hammer-forged with octagonal rifling, and the dual Recoil Spring Assembly (RSA) helps control the pistol. 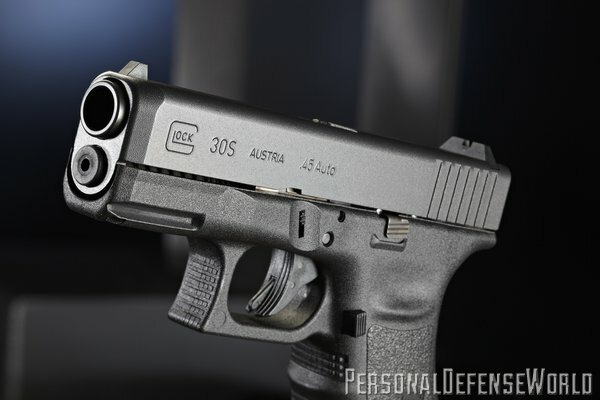 A cutting-edge hybrid, the new GLOCK 30S combines the firepower of the GLOCK 30 SF frame with a comfortably slim, concealable slide while maintaining a 10+1 capacity. The .45 AUTO bore is quite noticeable from this angle. 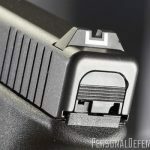 Also note the GLOCK accessory rail for attaching lights and lasers. 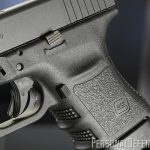 GLOCK has a new model, the G30S (Slim), developed for an elite law enforcement unit and an exceptional GLOCK for concealed carry, whether for LE or a licensed United States citizen. 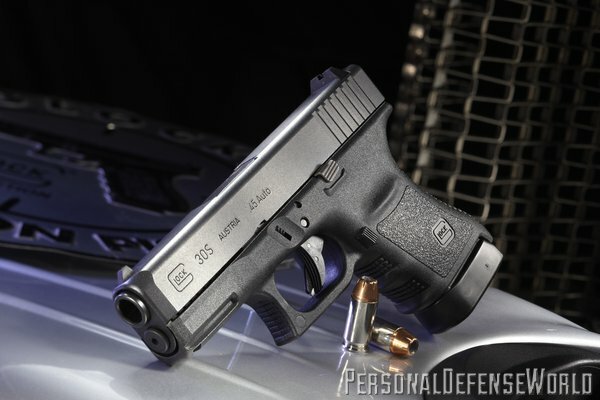 Essentially, GLOCK engineers took a slender GLOCK 36 in .45 AUTO and mated parts of it to the big-bore GLOCK 30 SF. 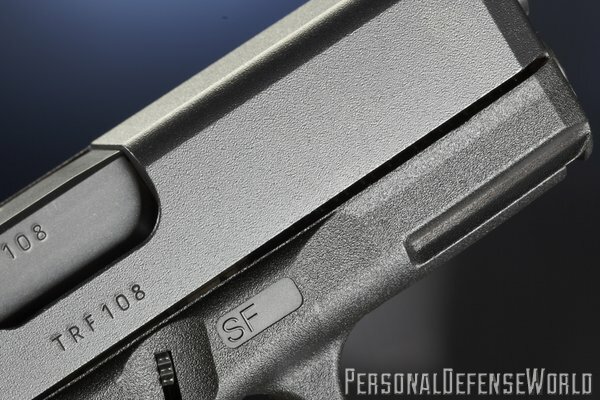 “SF,” for those coming in late, stands for “Short Frame.” Specifically, the SF version has a particular modification that distinguishes it from the older major-caliber subcompact, the GLOCK 30. 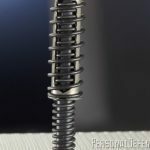 The trigger reach—that is, the distance from the face of the trigger to the top of the backstrap—has been reduced by a few millimeters. 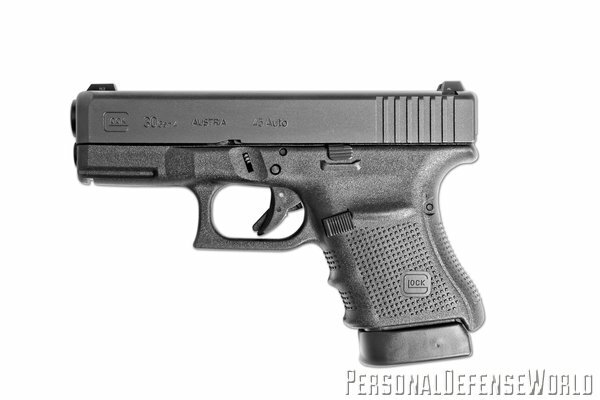 GLOCK first introduced this redesign with the GLOCK 21 SF, which was developed for the U.S. military. 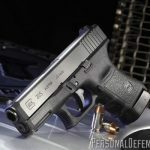 In time, it was introduced into the larger models like the G30 SF and found its way into the next generation of GLOCK pistols, the Gen4. While this reduction is not detectable visually, it is significant tactilely. 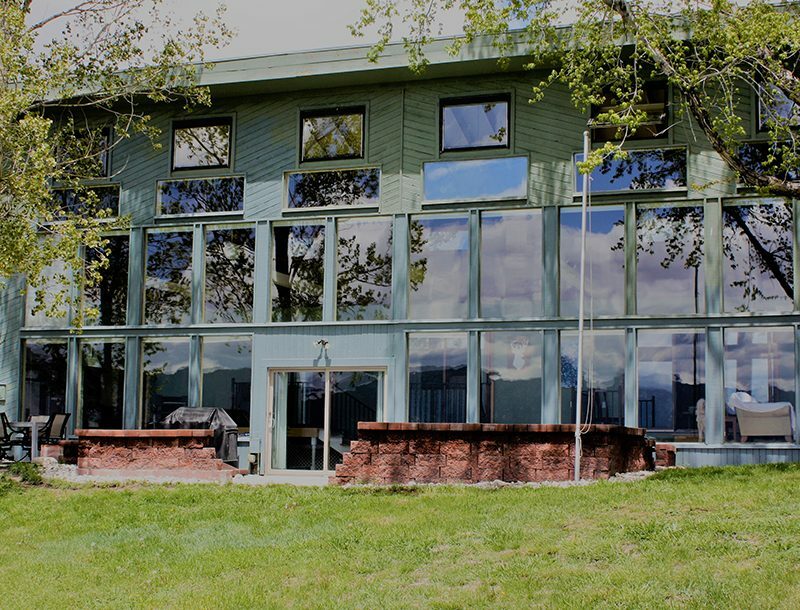 That is to say, it feels different—better, according to the vast majority of operators. A subjective measure, positive “feel” nevertheless is central to confidence, which translates to positive performance under pressure. The G30S was created for law enforcement officers who confront violent and non-submissive criminals; confidence is paramount. 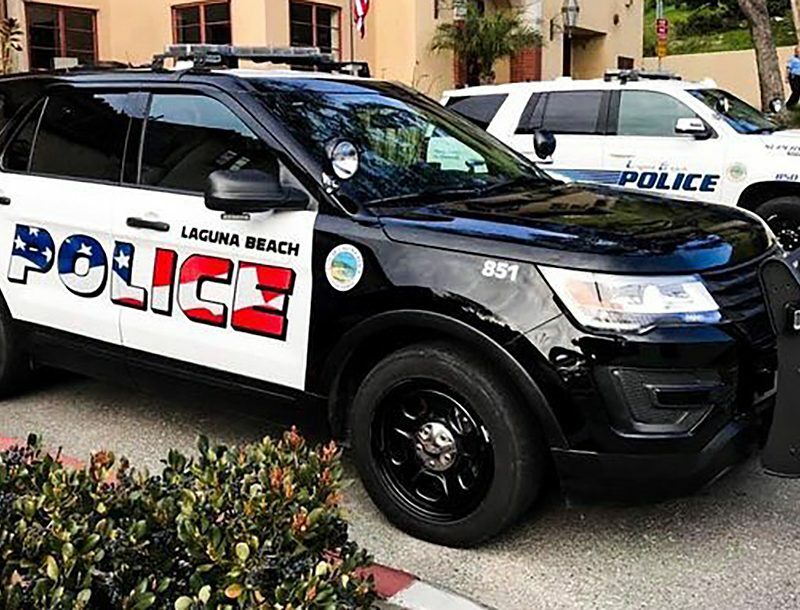 These officers typically function in an undercover or plainclothes role. 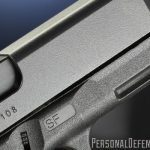 Hence the need for comfortable concealability, and that is where the “S” comes into play. 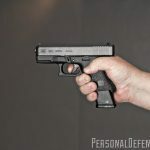 The GLOCK 36 is not well known, but it is one of the more comfortable GLOCKs to carry. 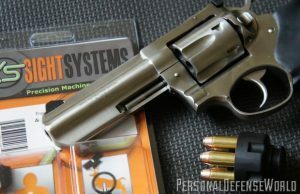 It has a slim, single-stack magazine, seven rounds of .45 AUTO ammunition on board with a fully loaded magazine and one in the chamber. 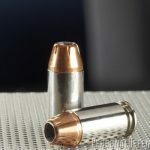 While perhaps sufficient for off-duty use and civilian concealment, it is a little light in ammunition capacity for LE operations. 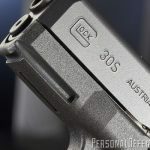 The GLOCK 30S has a 10+1 capacity and can take the larger 13-round magazine of the GLOCK 21. So, was there a way to have the best of both? Yes. 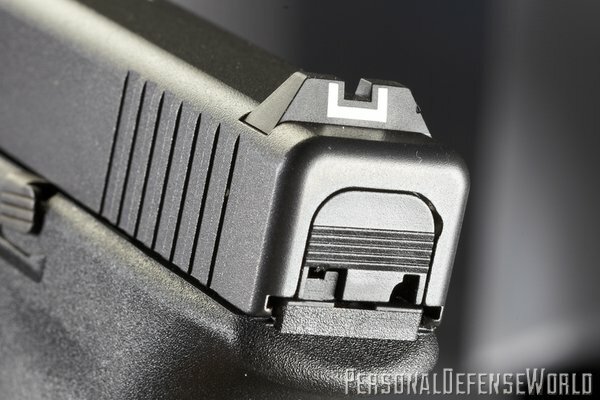 The GLOCK 36 slide would fit on the large subcompact frame. The key would be making it work. 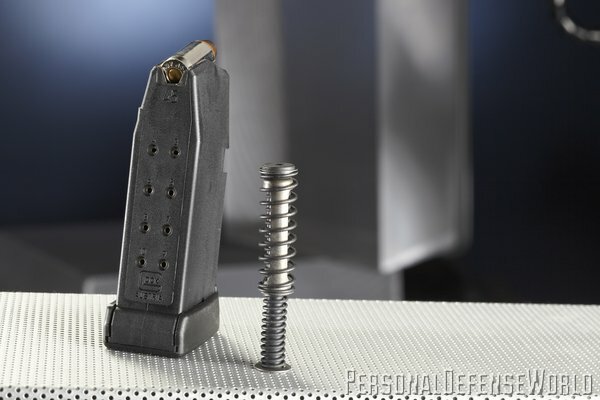 Again, after some GLOCK engineering, the 30S was born. We received our G30S as the initial shipment went out to an elite law enforcement unit. 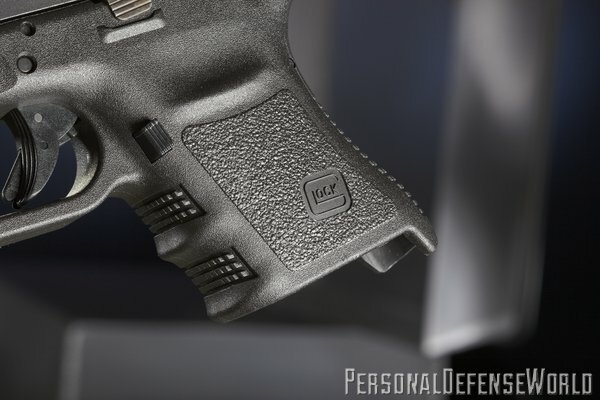 The initial examination showed the world-renowned GLOCK external qualities: the paradigm-setting polymer receiver, the first that was commercially successful; the GLOCK SAFE ACTION® fire control system, allowing instantaneous use with three independent, automatic safeties; a super-hard, corrosion-resistant, low-reflective external finish on the slide, barrel and GLOCK night sights; and the GLOCK standard cold-hammer-forged barrel with octagonal rifling for the .45 AUTO cartridge. 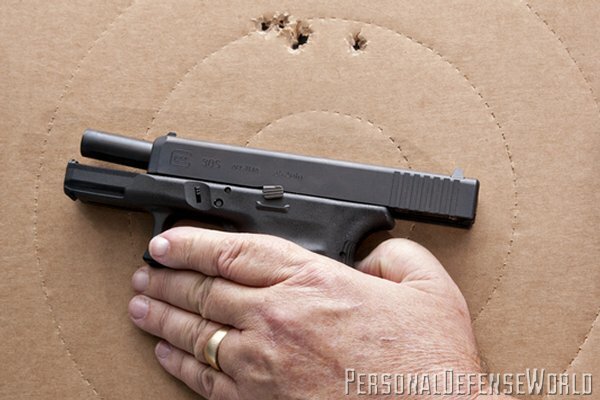 It was obvious the pistol was a GLOCK, with the world-recognized recurved triggerguard and grip angle. 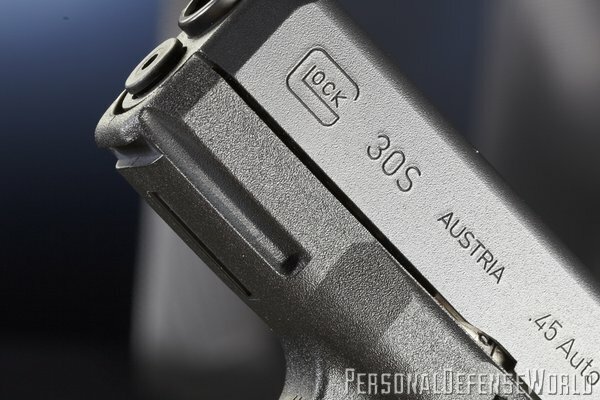 From a slight distance, it appeared identical to a GLOCK 30, but close examination revealed the “30S” designation on the side of the slide, and the slide is thinner than the G30’s! A true hybrid had been born. 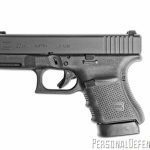 Picking up the GLOCK 30S, the Short Frame/Gen4 frame design was evident in the immediate comfort of the grip. 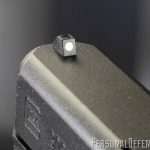 The standard magazines have a 10-round capacity, with the extended baseplate supporting the little finger of the shooting hand. 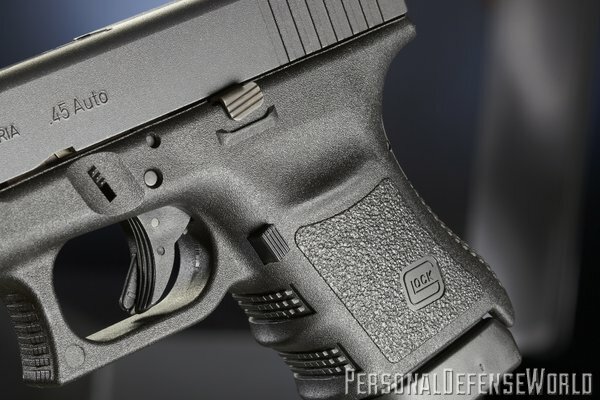 The G30S can accept the G21 13-round magazine. Molded checkering provided adequate traction. Subjectively, the pistol felt “lighter”(it is, slightly) and “livelier” in the hand. 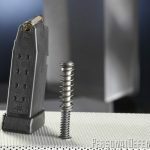 The final proof would be testing it at the range. 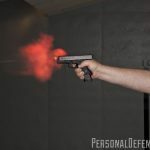 It was time to head off to the GLOCK Professional indoor range in Smyrna, GA, located near GLOCK, Inc.’s North American headquarters, overseen by Director Alan Ramsey. 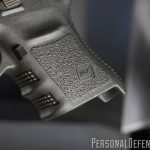 In preparing for the range, we noted that the G30S fit in some holsters designed around the GLOCK Compacts (G19/G23/G32). That was a definite plus—major-caliber performance in compact size. The elite LE officers would surely appreciate the comfort in concealment. And the shorter barrel and slide would clear a holster that much quicker in a lethal-force situation. 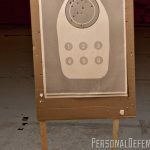 We began the range session with a few combat shooting drills: multiple shots to the larger portions of a humanoid-shaped target, followed by the delivery of precision hits to areas representing the central nervous system. This was, after all, the environment the G30S would find itself in: immediate defense of life in the face of lethal threats. 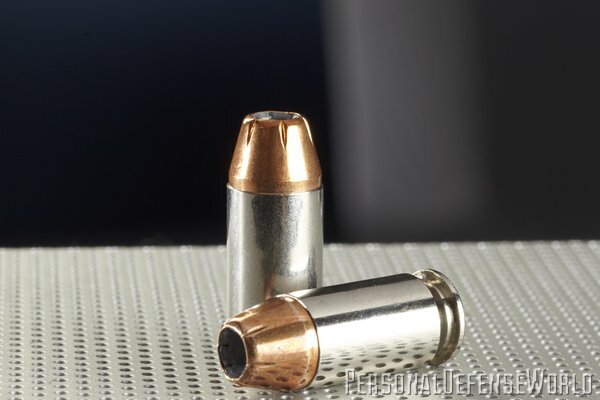 The .45 AUTO cartridge has been recognized by all as a powerful one since 1911. 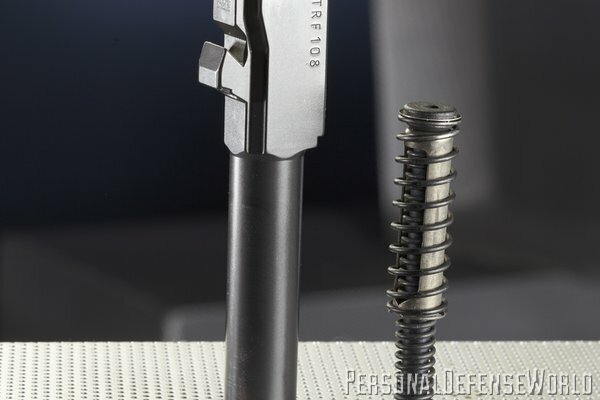 Its control depends upon understanding and utilizing a modern isometric shooting technique. 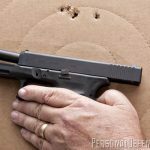 GLOCK Professional employees that were present included practical shooting competitors with decades of experience and retired law enforcement personnel, some of whom were instructors. All were enthusiastic about the new hybrid—to the point of placing an order. Felt recoil is indeed subjective. But to this correspondent, the G30S seemed to cycle its slide faster with less felt recoil at either end of the stroke. The G36-sized slide has a good deal to do with this. 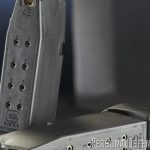 A number of years ago, I ran a G36 for a year of IDPA competition. 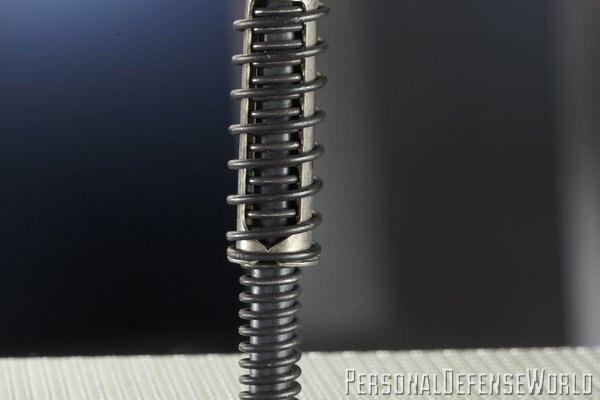 To the web and palm of the hand, the recoil was sharper—not painful, but certainly different from the larger double-column receiver. Definitely a better tool for the job. 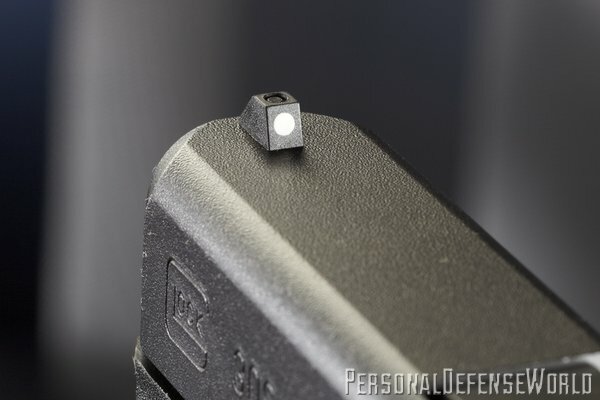 Accuracy was up to GLOCK standards: Excellent. Your correspondent has fired a group at 50 yards into the head of an LE target that measured about 5 inches. 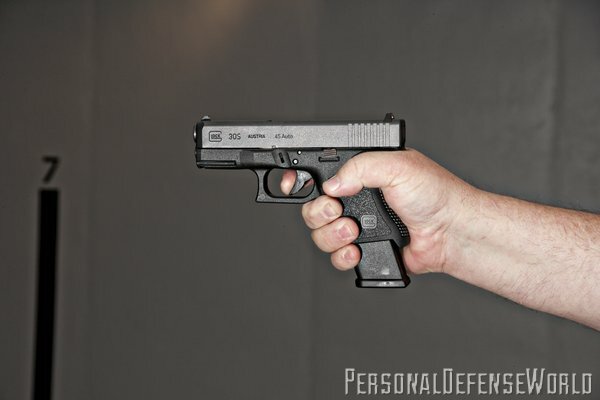 Countless gun writers within the firearms’ industry have fired excellent groups from GLOCK .45 AUTO pistols. 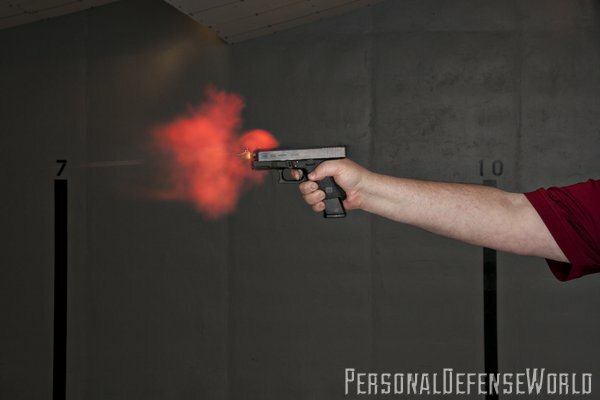 In Massad Ayoob’s case, he bought the test gun! Accompanying photos show our efforts, which were quite satisfying. There were no malfunctions observed and none were expected. The G30S had been extensively tested by GLOCK Inc. technical personnel, led by William Carmichael, Technical Services Manager. He reported no problems with the final version. And it will serve law enforcement well. 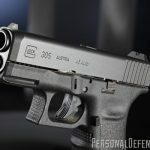 The new GLOCK 30S—a hybrid for hellacious situations!